Semiya payasam / vermicelli kheer is a traditional South Indian festival dessert made by boiling vermicelli with milk and sugar and flavored with cardamom, raisins and nuts. Wish you all a great year ahead and happy blogging! Due to some unexpected changes at the personal front, have been away from blogging for a long period. So I'm back with a sweet dish to begin the new year and to celebrate my joy of blogging again. Is there anyone who doesn't love payasam? Yes, there is, and that's me! I'm not quite fond of payasam. 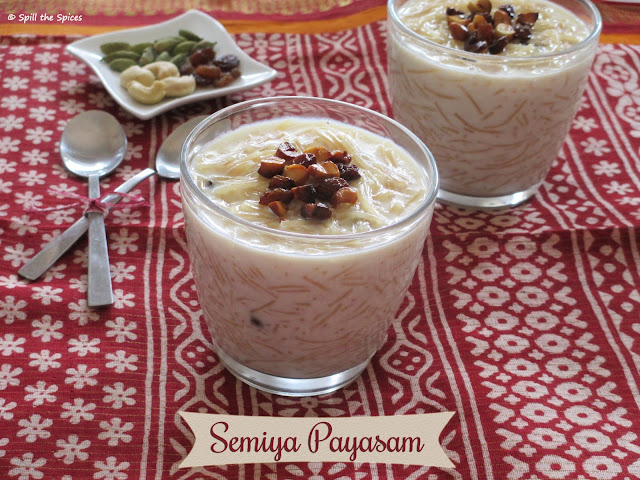 But Semiya Payasam is one dish which I like a little bit among the payasams. Its quite easy to make and can be prepared in less than 30 minutes. Serve this payasam hot or cold. 1. In a pan, heat ghee. Add the raisins, cashewnuts and fry till golden. Keep aside. 2. Boil the milk and keep aside. 1. Roast the vermicelli in 1 tbsp ghee until it turns light brown. If you have roasted vermicelli, you can skip this step. 2. To this add 2 1/2 cups of boiled milk. Allow it to boil and cook till the vermicelli becomes soft. 3. Now add the sugar and mix well till the sugar dissolves completely. Then add the remaining milk, cardamom powder and mix well. 4. Bring to boil and then simmer for 2 minutes. Remove from heat. 5. Add the roast cashewnuts, raisins and mix well. 1. 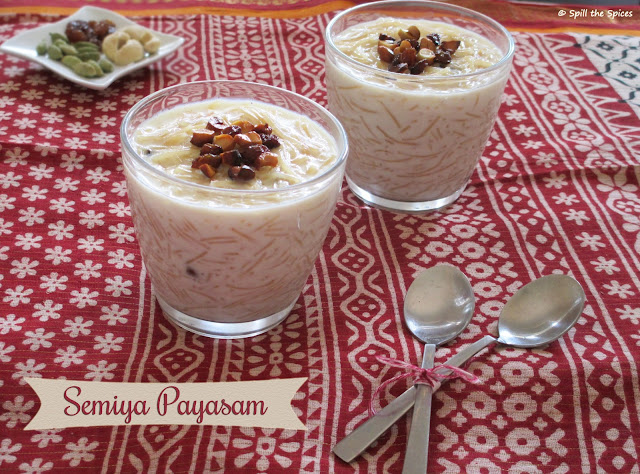 The payasam gets thicker as it cools down. You can add warm milk before serving. 2. You can cook the vermicelli in water and then add it to milk. But cooking the vermicelli in milk makes it richer and creamier. Great to see you back in action..
Payasam looks very very delicious.. Thanks for linking it into my blog event. happy new year..yummy and healthy. 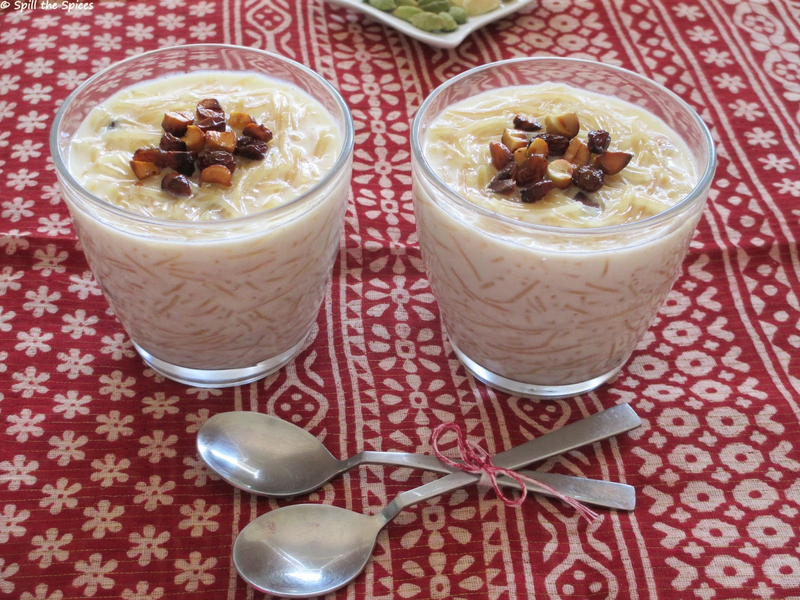 Payasam looks delicious, nice presentation.